Caption: But officer, de cyar run just fine with three tires! Caption: a dat mi a tell,yu a no femi car a barra mi barra it. Caption: Officer: "Come outta de car! Why ya drive so wile fa, eh?" Taxi Man: "There's a bee in my car!!" Caption: Yuh want a ride officer? Caption: No sah! Mi neveh know seh a police bike otherwise mi never would a borrow it fi go a bashment last night! Caption: Dread: That picture was before me grow mi Locks. 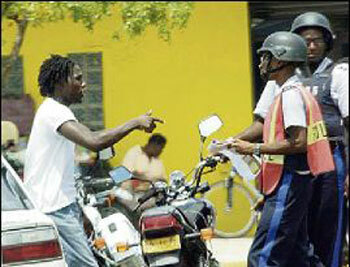 Caption: I give you $25000.00 fi di bike officer! Caption:But officer! Is purely for medicinal use! Mi have glaucoma! Thank you for the 260 responses we received. Enter again and we hope you will be the outright winner next time.